Wednesday January 1st 1908 I got up about 7.30, telephoned to Will and then walked over the river in time for breakfast. Will came down to dinner and I got home at 4.20. Hattie & I knotted the carpet today that Mother gave me for Christmas. Fannie was sick in bed too bad. Anna [illegible] died while I was away. Thursday January 2 1908 I was busy all forenoon with the dinner and some sweeping I had to do. I went down home in the afternoon I visited with Mother awhile Hattie was down to Fannies she is still sick. Weather quite pleasant again Read in evening. 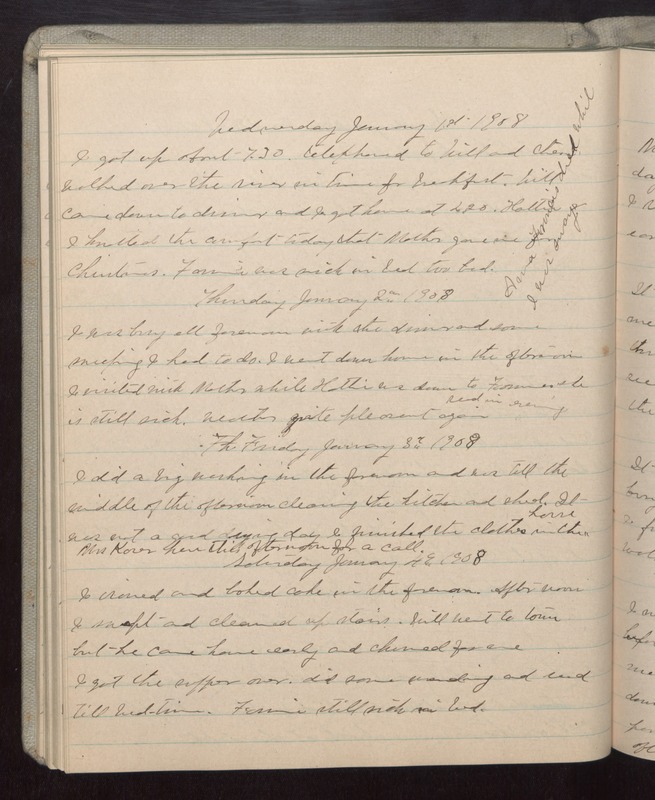 Friday January 3 1908 I did a big washing in the forenoon and was till the middle of the afternoon cleaning the kitchen and shed. It was not good drying day I finished the clothes in the house. Mrs [Kover?] here this afternoon for a call. Saturday January 4 1908 I ironed and baked cake in the forenoon. After noon I swept and cleaned upstairs. Will went to town but he came home early and churned for me I got the supper over. did some mending and read till bed-time. Fannie still sick in bed.